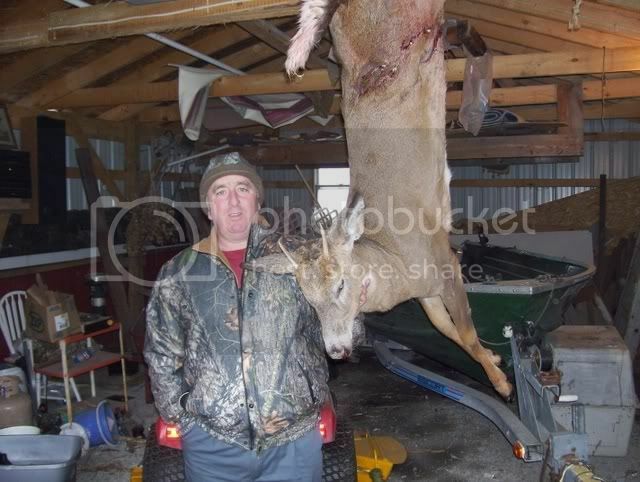 I shot this on the opening day of the gun season for White tailed Deer in NYS last Thursday. It was shot from a tree stand using a 16 Bore 7 shot Winchester with a solid slug. I'm feeling quite smug for a total beginner, all the seasoned hunters who I know here never saw a deer. I got home yesterday and the venison by now, will be resting in my mates freezer. Nice deer Bodger. I can't help noticing that you're wearing that most American of hunting clothing - high visibility camoflague. 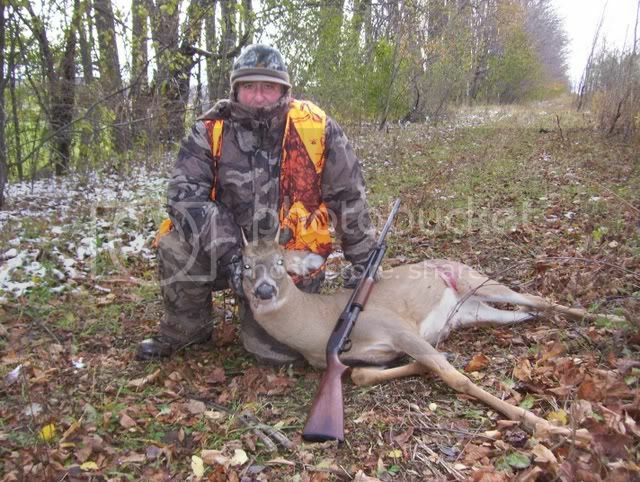 I know that hi-vis jackets are a requirement for hunting in the US, is the theory that deer etc are colour blind so the camo pattern works for them but the bright orange still keeps the high visibility for humans ? I think so Shepshed. The hills sounded as though they were under siege on what was the first day of the gun season. It was shot from a tree stand using a 16 Bore 7 shot Winchester with a solid slug. I'm curious to know how quick the kill was and do they use rifles much over there? The different weapons have different seasons in the US. The bow season comes first, then the muzzzle loading season followed by the gun season. This includes rifles and shotguns. Shot guns are used with a rifled solid slug. Nice Deer mate, shame you couldn't bring it home.